Come enjoy a special time with your baby or toddler! You will enjoy delightful music and activities with your baby or toddler and also interaction with other parents and their children. 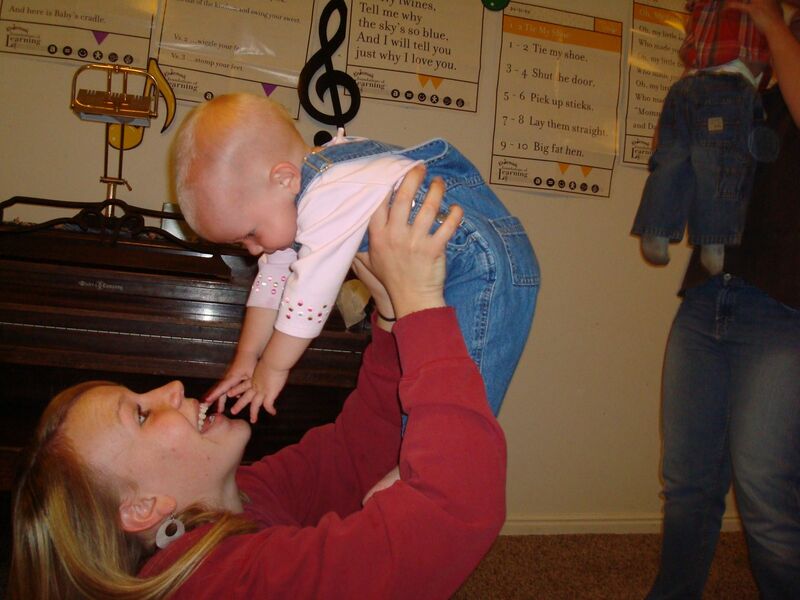 Simply put, Discovering Music for Babies & Tots is a music and movement program. Each week in class you’ll play, listen, and dance to music that will impact you and your child in profound ways. That’s because every song, story, and two-step has a carefully chosen purpose in this creative curriculum—one that’s designed to stimulate and strengthen the vital neural wiring taking place in your child’s mind, right now. I will guide you every step of the way so you know how each activity contributes to your child’s overall growth and development. Our curriculum uses the latest research with proven methods. Our child-centered curricula incorporate ongoing, in-classroom studies with 30-years’ experience in music and child development. Plus, we’ve combined the best music learning methods found in Orff, Kodaly, and Suzuki. All while strengthening the emotional bond between you and your child. So whether it’s twirling under a sea of scarves, experimenting with age-appropriate instruments, singing about a scampering squirrel, creating a musical ensemble, or snuggling in your lap during story time, Discovering Music for Babies & Tots speaks your child’s language and offers her (and you!) the best music and movement class available. Each Discovering Music for Babies & Tots class is a world of discovery and adventure. In every class, you'll witness your child's developmental evolution in language skills, literacy, listening, problem solving, social skills, self-esteem, and musicality. And it happens within a nurturing environment full of energy, imagination, music, dancing, sign language and playful delight. Email Bonnie today about our FREE Demo class! Call for a FREE demo class! 45 minutes Tuesday 12:30 a.m.
45 minutes Tuesday 11:00 a.m.
45 minutes Tuesday 11:45 a.m. Happy Healthy Parent Flyer.pdf, How I'm Keeping My Classroom "Happy and Healthy."